Regularly scheduled aircraft maintenance is an essential component to maintaining the airworthiness of any aircraft. 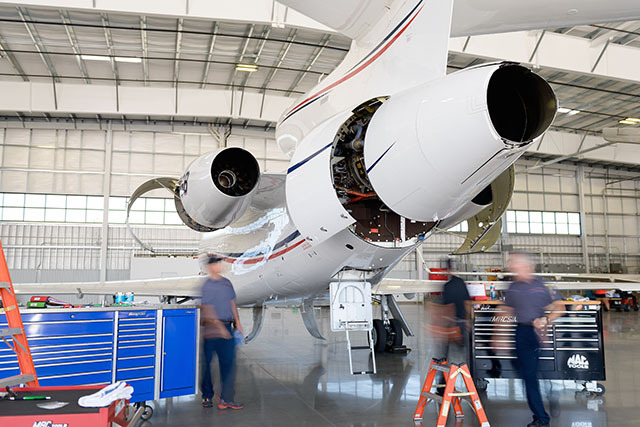 Unlike a car where maintenance is optional, every jet has a specific maintenance timeline— when inspections must be completed— that are outlined by a combination of governing groups. These groups include the Maintenance Review Board, aircraft manufacturer, and FAA; and exist to ensure that maintenance standards are implemented for overall aviation safety. Without the required maintenance, an aircraft is legally “grounded” or unable to fly. The aircraft acquisition age is an important point of consideration when determining scheduled maintenance requirements for the future. Generally, a jet is owned for six to eight years before an owner chooses to upgrade or sell. If a larger aircraft is acquired new, and sold between the average six to eight-year mark, this could place the jet slightly past the warranty and before heavy maintenance overhauls, like a D-Check. A D-Check is a costly and lengthy inspection that requires a detailed and complete review of every fastener, nut, and bolt. For an older aircraft, scrapping the jet for its components is sometimes more cost-effective than the process of a comprehensive overhaul. Working with a director of maintenance, aircraft manager, and trusted team of maintenance professionals is the best course of action to maximize efficiency, manage costs, and alleviate unnecessary inconveniences. Intensive maintenance inspections are often blocked together as “batched” tasks— maximizing both efficiency and safety. For added efficiency, Clay Lacy operates a certified maintenance center at Van Nuys Airport, Boeing Field and McClellan-Palomar Airport; and offers jet owners priority access, to the extensive charter fleet, when their personal aircraft is down for maintenance. This added benefit allows clients to maintain their travel schedules and appointments without interruption or delay. During a private jet’s lifetime, the aircraft will experience maintenance events that range from light checks to thorough overhauls. By working with a certified aircraft sales associate, consulting with an aircraft manager and experienced maintenance department— jet owners can be confident that they will experience the highest levels of safety, service, and value. With a dedicated facility, highly experienced technicians, and strong vendor relationships, Clay Lacy’s maintenance team prioritizes every aspect of aircraft maintenance. Contact a maintenance professional today!